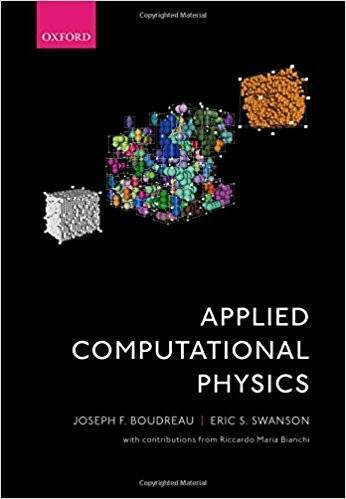 Joseph F. Boudreau,‎ Eric S. Swanson, "Applied Computational Physics"
Applied Computational Physics is a graduate-level text stressing three essential elements: advanced programming techniques, numerical analysis, and physics. The goal of the text is to provide students with essential computational skills that they will need in their careers, and to increase the confidence with which they write computer programs designed for their problem domain. The physics problems give them an opportunity to reinforce their programming skills, while the acquired programming skills augment their ability to solve physics problems. The C++ language is used throughout the text. Physics problems include Hamiltonian systems, chaotic systems, percolation, critical phenomena, few-body and multi-body quantum systems, quantum field theory, simulation of radiation transport, and data modeling. 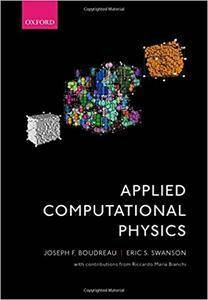 The book, the fruit of a collaboration between a theoretical physicist and an experimental physicist, covers a broad range of topics from both viewpoints. Examples, program libraries, and additional documentation can be found at the companion website. Hundreds of original problems reinforce programming skills and increase the ability to solve real-life physics problems at and beyond the graduate level.